Is it snowing in La Villa (Alta Badia) ?¡Gracias! Moderate rain (totál 10.0mm), heaviest el lunes por la noche. Very mild (max 14°C el domingo por la tarde, min 1°C el sábado por la noche). Wind will be generally light. Heavy rain (totál 51.0mm), heaviest durante la noche de martes. Very mild (max 10°C el jueves por la tarde, min 4°C el martes por la mañana). Wind will be generally light. La tabla anterior muestra el pronóstico de tiempo para La Villa (Alta Badia) en la altitud específica de 1433 m. Nuestros modelos meteorológicos sofisticados permiten prever pronósticos para la cumbre, la mitad y la base de La Villa (Alta Badia). Para aceder a los pronósticos de tiempo a otras alturas, pinche en la navegación en la parte superior de la tabla. Para una visión general, consulte el Mapa meteorológico de Italy. Nombre de la estación también escrito como La Villa. If you are looking for a top-notch skiing resort,this is as good as it gets. Located in Val Badia, in the heart of the Dolomites,La Villa boasts the Alpine Ski World Cup's toughest giant slalom run,the famous Gran Risa (slope: 36% average, 53% maximum) and is connected with 130Km of runs in the valley. The resort is a perfect base for an incredible variety of alternative ski tours across the Dolomites: aside from the well-known Sella Ronda, you can take the 90Km, 8-hour 1st WW ski tour all the way to Alleghe and Zoldo (try the excellent 63% slope black called Laghetto over there! ), or ski through Arabba as far as Falcade and Moena in one day! 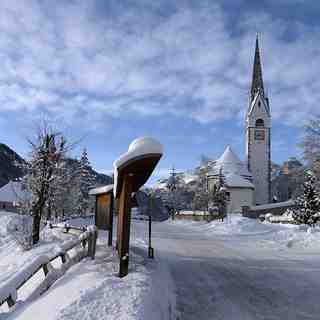 The neighbouring valleys Val Gardena and Arabba also offer world-class black runs, such as the Saslong and Fodoma, respectively. The trendy life and skiing of Cortina are also within reach and next year - once the new Piculin gondola is completed - it will take only 20 min by skibus to access the large resort of Plan de Corones/Kronplatz and its well-known Sylvester black runs. In short, you could ski for 7-10 days without taking the same run twice! 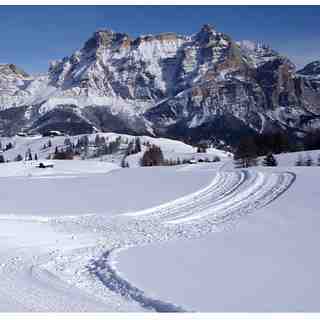 Beginners and intermediate skiers and snowboarders will enjoy the very long and generally blue or red runs of Val Badia itself, thanks also to the valleys world-class ski school. The valleys have breathtaking landscapes. Do not miss the incredible scenery on the Lagazuoi run and the unspoilt spots will also give eager photographers a run for their money. Nightlife tend to be subdued, making the place more suitable for families with children and couples looking for romantic dinners.